You have survived the hassle of looking for a job and finally you have a chance to be interviewed. Job interviews offer a great opportunity for the candidate to sell themselves and their skills to potential employers. Job interviews are usually brief, 20 to 30 minutes, hence the importance to make most of this time. Today we explore different ways of impressing the interviewer from the initial introduction to exiting the office. It is the combination of solid preparation, self-confidence, and common courtesy that will set you apart from other candidates. Segment One: Preparing for the Interview. Usually, first impressions are formed within the initial 30 seconds of meeting. The first obvious thing the interviewer will notice before you say anything is your physical appearance. Therefore, pick a wardrobe that communicates effort and professionalism. It is recommendable to research the company’s dress code beforehand. You can read more on how to dress for an interview here. Thumb rule; never go for an interview without prior knowledge of the company. Doing so will convey a lack of interest and respect on your part. Do thorough research on the company. What do you focus on? Know the skills the company values, pay close attention to the desired qualifications listed on their job postings. This will offer you an opportunity to learn more about the organization and help you focus on aspects of your skill set and career history emphasize. It’s also best acquaint yourself with the latest news involving the company. c.Prepare stories that illustrate your skill-set. Concrete is better than abstract when it comes to impressing an interviewer. Prepare a few solid stories that illustrate your experiences. It is natural for people to remember stories easier than direct information. Consequently, this will mean that telling a story rather than simply conveying your experience will make you stand out in the interviewer’s mind. Ask yourself, what are the skill sets this company is looking for? Write down a list of skills and, from there, try to come up with stories from past jobs, volunteer experiences, and internships that illustrate your proficiency with the said skills. d.What you post on your social media accounts matter. It is so easy to judge someone with what they post on social media. Make sure your social media presence is clean before going into an interview. For instance, curse words do not reflect well on you as a potential employee. Make sure any obscenity is removed. To be more cautious you can temporarily deactivate your Facebook or Twitter profile the week before your interview; or change your privacy settings so that only certain posts are visible to the public. Segment Two: Making the Most of the Initial Introduction. Arriving late for an interview is a major NO! Arriving exactly on time may also reflect poorly on you. Aim to show up 10-15 minutes early, but not earlier than that. Arriving early reflects initiative, drive, and good time management skills. Some quick tips as you wait for the interview: stay off your phone, briefly review any notes you have, but do not go overboard as this can increase your anxiety, sit up straight and be attentive. Simply, convey confident body language while waiting as this will set the tone for your interview. b.Be friendly to everyone you meet. A fact to remember is that an interview starts the moment you enter an establishment. Treat the secretaries or other employees with courtesy as you navigate your way through the venue. Your interviewer might ask about your behavior afterwards, so be sure to be friendly and engaged with everyone you meet and not just the person conducting the interview. A good handshake is important. 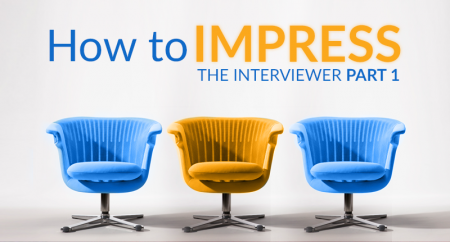 This is your first opportunity to impress an interviewer. Offer a handshake that is neither too limp nor too hard. Both methods can be off-putting. Use body language that conveys confidence and respect from the moment you enter the room. In the interview room put any belongings, such as a briefcase or purse, on the floor beside you. Holding onto these items during an interview is awkward and distracting. Placing them on the interviewer’s desk can be seen as intrusive. Sit up straight in a manner that displays your neck, chest, and stomach. Do not lean forward. This makes you look nervous or aggressive. Check back in next week for Part Two of this series. We’ll address interview engagement and how to make sure you leave an impression when your interview is all done.